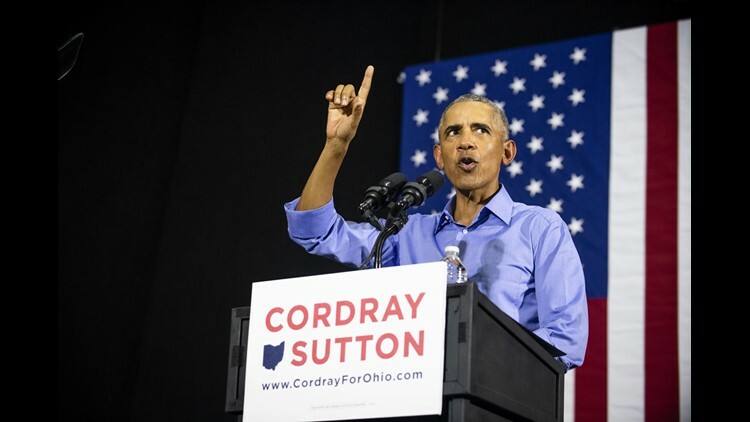 Former President Barack Obama speaks during a campaign rally for Ohio Gubernatorial candidate Richard Cordray at CMSD East Professional Center Gymnasium on Sept. 13, 2018, in Cleveland, Ohio. After former President Barack Obama made a stop in Columbus, Ohio, on Thursday, the wealthiest Republican donor in the state announced he is leaving the party. "I just decided I’m no longer a Republican,” L Brands CEO Leslie Wexner said Thursday, according to The Columbus Dispatch. Wexner said he has been a Republican since joining the Young Republican Club at Ohio State. "I won’t support this nonsense in the Republican Party," Wexner said, according to the Dispatch, adding that he is now an independent. After Obama stopped briefly in Columbus before making an appearance in Cleveland, Wexner said he "was struck by the genuineness of the man; his candor, humility and empathy for others." Wexner has been a vocal critic of President Donald Trump. After Trump said there were "very fine people" on both sides of a confrontation between white supremacists and protesters in Charlottesville, Virginia, in 2017, Wexner said he felt "dirty" and "ashamed." On Thursday, Wexner said that incident caused him to lose sleep and the Dispatch reported that he remembered thinking, "I have to do something because the leader of our country is behaving poorly." The billionaire has made large donations to groups promoting bipartisanship and civility. He and his wife donated $2.8 million to With Honor, a "cross-partisan" PAC working to elect "principled" military veterans, according to the Federal Election Commission website. In 2017, Wexner gave more than $200,000 to the National Republican Congressional Committee, the FEC reported. As recently as May, Wexner donated $33,900 to the National Republican Congressional Committee and another $33,900 to a political action committee supporting House Speaker Paul Ryan, R-Oh. L Brands is the parent company of Victoria's Secret and Bath & Body Works. According to Forbes, Wexner is worth $4.7 billion, making him the wealthiest resident of Ohio.